The Mary River mine is not the first mine to developed in Nunavut, nor will it be the last. Mining projects in Nunavut are becoming increasingly feasible from a technological and economic point of view. Climate change will make mining and resource development more attractive and accessible. The Nunavut Land Claims Agreement provides important protections for Inuit rights in the context of mining, including their right to benefit from the exploitation of natural resources on their lands and territories. The context of mining in Nunavut helps to remind us that the success of the Mary River project is not just the responsibility of the Baffinland company. It includes the different levels of government and the Designated Inuit Organizations. The Mary River mine is not the first mine to developed in Nunavut, nor will it be the last. There have been a number of previous mines, although smaller in scale than Mary River. 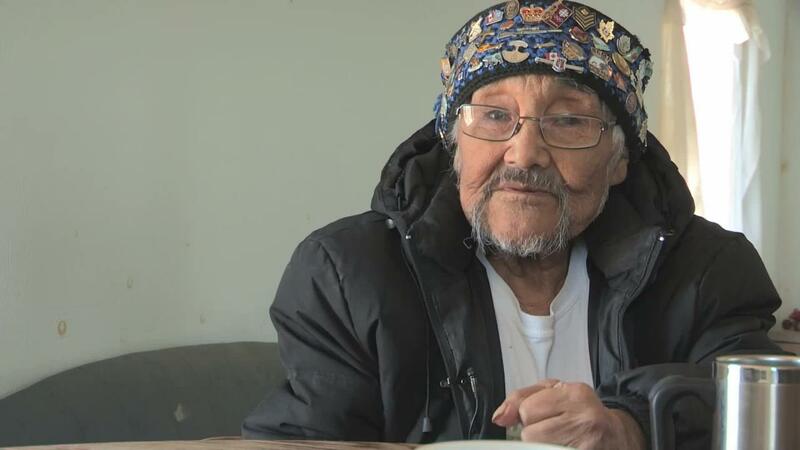 In the public hearings, some elders spoke about their experiences as workers at the Nanisivik and Rankin Inlet mines. Currently, there is one operating gold mine at Baker Lake and there are other deposits being explored and developed. In a 2012 publication, the Mining Journal called Nunavut “an emerging force in Canadian exploration and mining,” where billions of dollars will be invested in the next decade. There are many challenges and high costs for mining in Nunavut because of its northern climate and remote location. Nonetheless, mining projects in Nunavut are becoming increasingly feasible from a technological and economic point of view. Climate change will make mining and resource development more attractive and accessible. All levels of government are generally supportive of mining development: the Government of Canada sees the development of mines and other natural resource projects as part of its northern strategy for greater sovereignty and development in the arctic region; the Government of Nunavut sees mining as an important contribution to the economy of the territory in a context where there are few alternatives for economic growth; and, the Designated Inuit Organizations also see mining projects as providing opportunities for individual and collective benefits for Inuit. •	Some portions of the territory have been designated as Inuit-Owned Lands, meaning that Inuit own the sub-surface mineral rights and receive the royalties when the minerals are extracted. The main deposit at Mary River is on Inuit-Owned Lands. •	The Nunavut Impact Review Board was created to conduct reviews, public hearings and make recommendations about measures to protect Inuit and Nunavummiut from adverse environmental and social impacts of mining projects. The review of the Mary River mine began in 2008 and will continue this summer and fall with respect to the Early Revenue Phase. •	There is a requirement that all major development projects are subject to Inuit Impact Benefit Agreements, which are negotiated between the regional Designated Inuit Organization and the developer of a mine. The Qikiqtani Inuit Association is currently in negotiation of an IIBA with the Baffinland company. 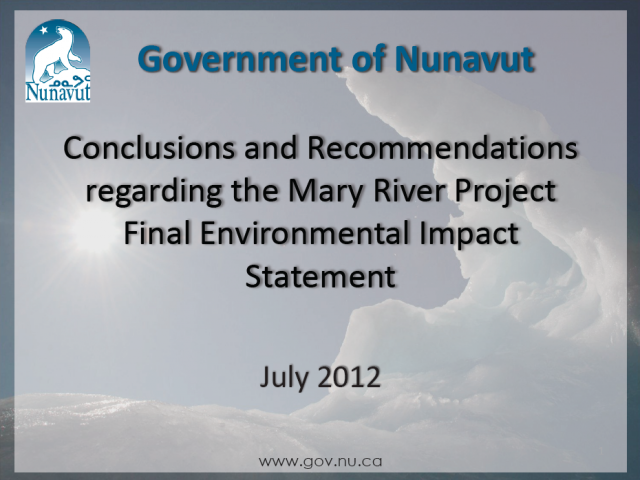 •	As the Government of Canada works to streamline environmental and social review processes, will the NIRB be able to conduct as rigorous impact assessments for future mining projects as it did for the Mary River mine? •	If there are numerous projects that are developed at the same time, will the NIRB have the capacity to conduct simultaneous reviews—while also fulfilling its responsibilities to monitor the implementation of the Mary River project certificate? •	As Mary River and other mines begin to generate revenues and profits, how will the economic and other benefits be allocated at the community level? The context of mining in Nunavut helps to remind us that the success of the Mary River project is not just the responsibility of the Baffinland company. 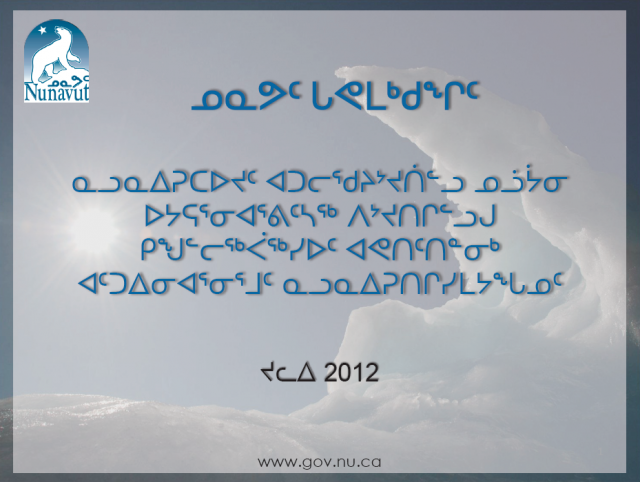 It includes the different levels of government and the Designated Inuit Organizations. In our human rights impact assessment, we provide recommendations for all of these actors to ensure that the mine respects human rights.